Post contributed by Thomas Gillan, Josiah Charles Trent History of Medicine Intern. 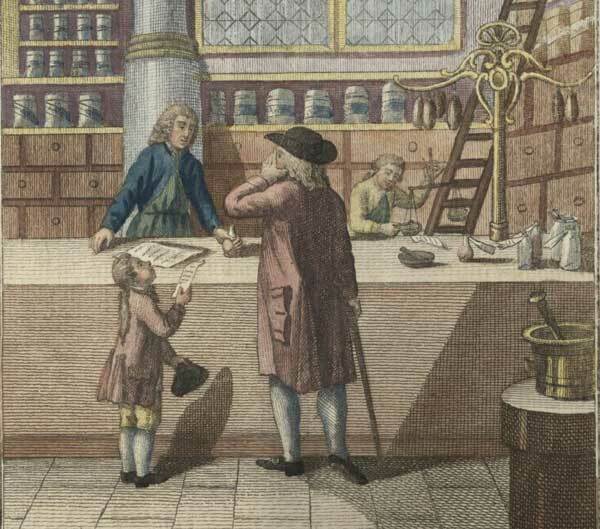 Engraving by Clemens Kohl featuring the interior of an apothecary shop. History of Medicine Picture File, 1523-2002, History of Medicine Collections. Among the 20,000 books and 4,000 manuscripts that together comprise the History of Medicine Collections at Duke’s David M. Rubenstein Rare Book and Manuscript Library—not to mention the collection’s hundreds of medical instruments and artifacts—is a large, leather-bound account ledger in folio kept by Hugh Mercer, an apothecary in Fredericksburg, Virginia, from 1771 to 1775. Born in Aberdeen, Scotland, in 1725, Mercer went on to study medicine at Marischal College, graduating in 1744 before taking up a post as an assistant surgeon in the army of Charles Edward Stuart, better known as Bonnie Prince Charlie. With the Scots’ defeat at Culloden in 1746, Mercer fled to America, arriving in Philadelphia in 1747. Mercer settled in what is now Mercersburg, Pennsylvania, where he practiced medicine for eight years. During the Seven Years’ War, Mercer served in the British army, where he met and befriended Colonel George Washington. Following his service, Mercer resettled in Fredericksburg, Virginia, a decision no doubt influenced by Washington. It was in Fredericksburg that Mercer, along with his business partner and fellow physician Ewen Clements, opened his apothecary shop. 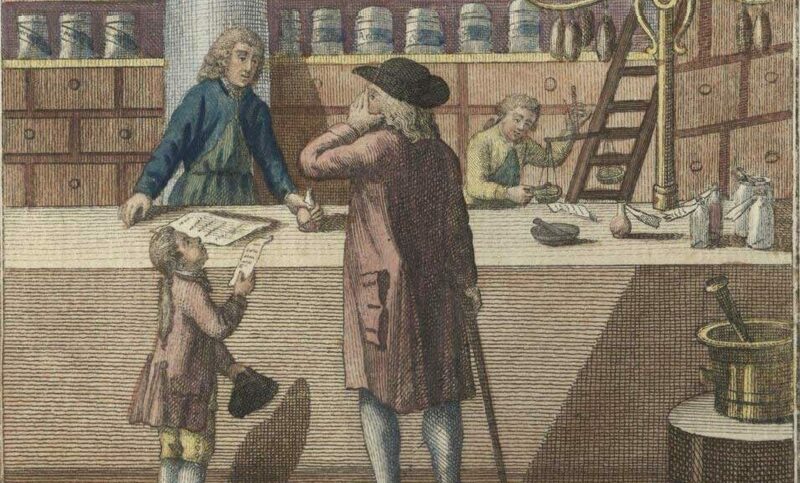 On May 28, 1771, in the Virginia Gazette, Mercer and Clements, “partners in the practice of physic and surgery,” announced that they had “opened a shop on the main street, opposite to Mr. Henry Mitchell’s store, furnished with a large assortment of drugs and medicines of the best quality, just imported from London; where Gentlemen of the profession and others may be supplied at easy rates, for ready money.” Together, Mercer and Clements compounded and dispensed medicines, diagnosed patients’ disorders, and prescribed and administered treatments. 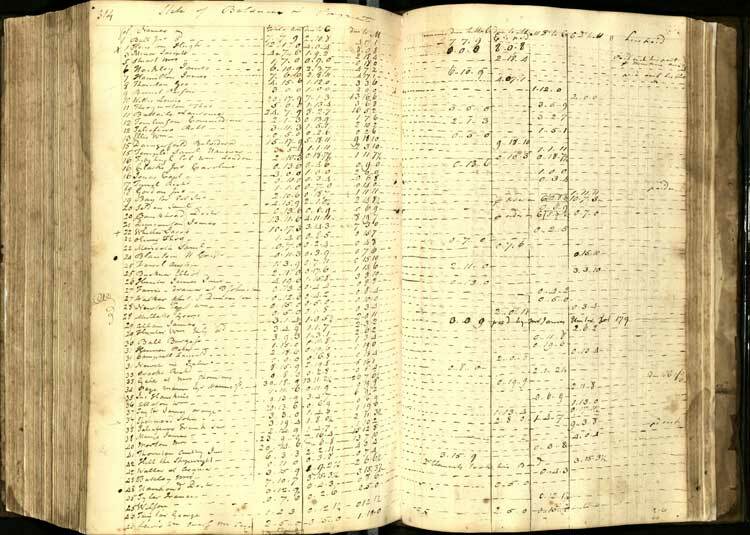 The ledger kept by Mercer, which documents the history of his practice from 1771 to 1775, is a microcosm of the social and intellectual worlds of eighteenth-century Virginia. It contains entries for more than three hundred different accounts. Below each entry, Mercer meticulously documented his visits with patients, the medicines he dispensed, the treatments he prescribed, as well as the fees he charged. 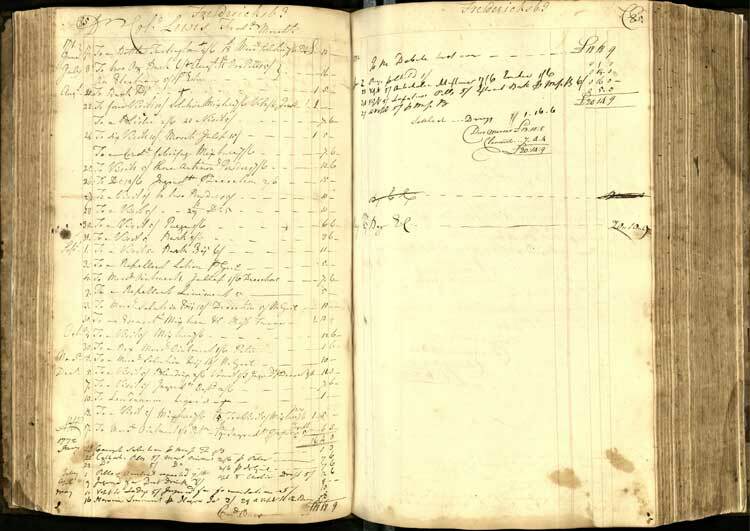 An entry in Mercer’s ledger for the account of Colonel Fielding Lewis, a Fredericksburg merchant and George Washington’s brother-in-law. Click image to enlarge. Among Mercer’s many patients were Mary Ball Washington, George Washington’s mother; Betty Washington Lewis, George Washington’s sister, and her husband Colonel Fielding Lewis; Thomas Ludwell Lee; John, Henry, and William Fitzhugh; and Mann Page. Mercer often noted the occupations of his patients, who ranged from merchants, planters, and gentlemen to tradesmen, schoolmasters, undertakers, and stage players. A number of women, many of them widows, kept their own accounts with Mercer. Also among Mercer’s patients were the enslaved men, women, and children whose visits were charged to their masters’ accounts. Mercer kept a running index in the back of the ledger for each of his accounts. Click image to enlarge. Mercer offered a range of treatments and services to his patients, from bleeding, purging, and pulling teeth to blistering, vomiting, and setting broken bones. He likewise dispensed a variety of compounds and medicines. These included saline mixtures, purging pills, febrifuge drops, liquid laudanum, balsam honey, magnesia, glauber salts, and stomach elixirs. In keeping with the medical science of his day, Mercer’s treatments were aimed at restoring the delicate balance of his patients’ four humors—black bile, yellow bile, phlegm, and blood—and ensuring equilibrium among the body’s solids and fluids. In all, Hugh Mercer’s ledger offers a unique window into the prevailing medical beliefs and practices of eighteenth-century Virginia society and represents only a sample of the Rubenstein Library’s rich collection in the history of medicine.